This outfit combo has been a true favourite of mine lately. The tweed jacket, gingham pants and fringe sandals are just oh-so-good! Oh wow that's stunning!! I love those bottoms and that you paired them with the pops of red! Oh wow!! !Such a glamorous, elegant and Summertime ready combo!!! Your jacket is majestic! Oh myyy! How CUTE are those shoes?! Love! 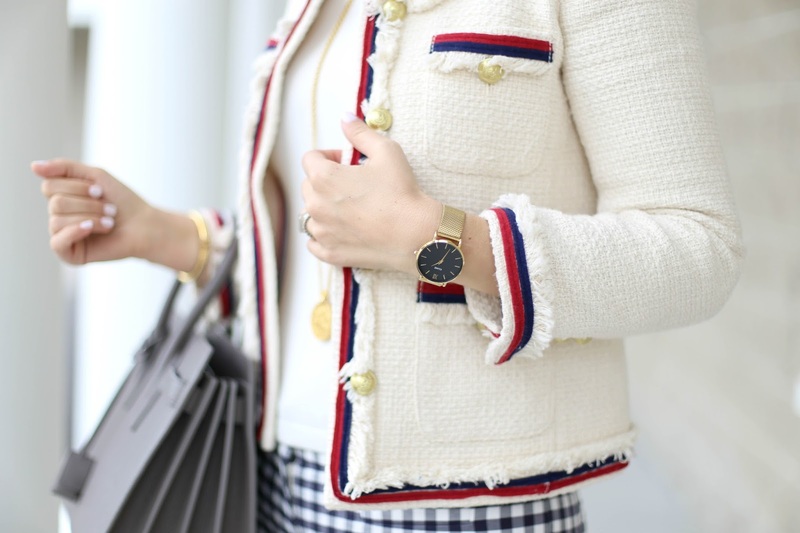 There are so many ways to wear those Chanel-like jacket. Yours is perfect ! I absolutely love this ensemble dear. Those colors look amazing on you. I have a question what kind of camera and lens are you using? Love your blazer! So chic. I love this outfit, the jacket and shoes are such a great combo! Beautiful photos. Love the shoes! !